CUTHMAN, (Eighth Century), a shepherd near Steyning in Sussex. St. Cuthman spent the time he was tending his flock in prayer and was known as a wonderworker. St. Cuthman also built what become the Church of St. Andrew and St. Cuthman (Church of England) in Steyning. Nothing further is known of this saint. ELFLEDA (ÆLFLAED), a Saxon princess, she was the daughter of King Oswy of Northumbria. Her father consecrated her to God in infancy, placing her in the care of St. Hilda (17th November) at Whitby. St. Elfleda succeeded St. Hilda as Abbess of Whitby and was a powerful force in Church affairs. She is said to have mediated a dispute between SS. Wilfrid (12th October) and Theodore of Canterbury (19th September), and to have aided St. Cuthbert (26th October). St. Elfleda reposed in 713. HONORATUS of MILAN, consecrated bishop of Milan in 567, succeeding St. Auxanus in that See. St. Honoratus' episcopacy coincided with both the Three-Chapter Controversy phase of the Arian heresy, as well as the Lombard invasions, with the Lombards driving him in to exile. St. Honoratus reposed in 570, without ever being able to return to his See. JUVENTIUS of PAVIA , the Roman Martyrology contains an entry on 8th February for St. Juventius at Pavia, a bishop who preached the Gospel. A much fuller entry exists on 9th December, which relates the evangelisation by SS. Syrus (9th December) and Juventius of Pavia. St. Juventius flourished in the First Century and served as the first Bishop of Pavia. KIGWE (KEWE, CIWA), (Date Uncertain), we know nothing certain about this saint. It is likely that she is the same as St. Ciwa, a sixth or seventh century saint venerated in Monmouthshire. She is listed in the Exeter Martyrology on 8th February, and there is a Welsh Kalendar that lists the name Kigwe or Kigwoe. Alternative spellings include Ciwg and Cwick. It is almost completely certain that she is not the same as St. Keyna (8th October), who has left her name to Keynsham in Somersetshire. MARY (MLADA), the youngest daughter of Prince Boleslav I of Bohemia. 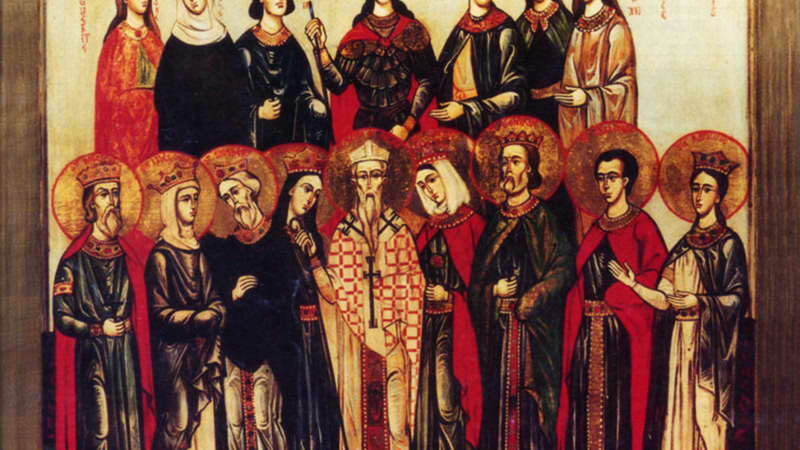 St. Mary was part of the delegation sent by her father to Pope John XIII, to request the creation of a diocese for Bohemia, which at the time was part of the Diocese of Regensburg. Whilst in Rome, St. Mary received monastic tonsure, and the name Mary. The delegation returned to Prague successful and St. Mary returned with a blessing to establish the first monastic community in Bohemia. St. Mary was the founding-Abbess of the Abbey of St. George which was located in Prague Castle. St. Mary served as Abbess of St. George until her repose in 994. MEINGOLD, (Tenth Century), a nobleman who lived in Huy on the Meuse in present-day Belgium. St. Meingold was renowned for his personal sanctity. Whilst returning from a pilgrimage, St. Meingold was murdered by bandits. NICETIUS (NIZIER) of BESANÇON, a seventh century Bishop of Besançon, in present-day France. St. Nicetius was also a friend of St. Columbanus of Luxeuil (23rd November). He reposed in 611. ONCHO (ONCHUO), (Sixth or Seventh century), St. Oncho was a pilgrim, a poet, a guardian of sacred traditions, as well as a collector of holy relics in his native Ireland. Whilst on one of his pilgrimages in search of relics, he reposed at Clonmore monastery, which was governed by St. Maidoc (28th February) at that time, and his body was enshrined there, along with the relics he had gathered during his life. PAUL of VERDUN, possibly a brother of St. Germanus of Paris (28th May), St. Paul was a hermit on what is now called Paulsberg near Trier. He later moved to the Abbey St. Maurice of Tholey in Saarland. St. Paul was consecrated Bishop of Verdun circa 630 serving until his repose circa 649. PAUL, LUCIUS, and CYRIACUS, (Date Uncertain), martyrs in Rome, of whom there is no further information.